THIS EVENT IS NOW SOLD OUT - PLEASE CHECK OUT OUR OTHER PARTIES WE ARE PUSHING EVERYONE TO AT KISS KISS IN THE TROPICANA HOTEL CASINO AND ROYAL JELLY NIGHTCLUB AT OCEAN RESORT CASINO See you & your friends there! Be sure to "Like" & "Share" above to help spread the word!! The biggest NYE Event in Atlantic City with 6 Parties under one roof and room for 3,500 people! 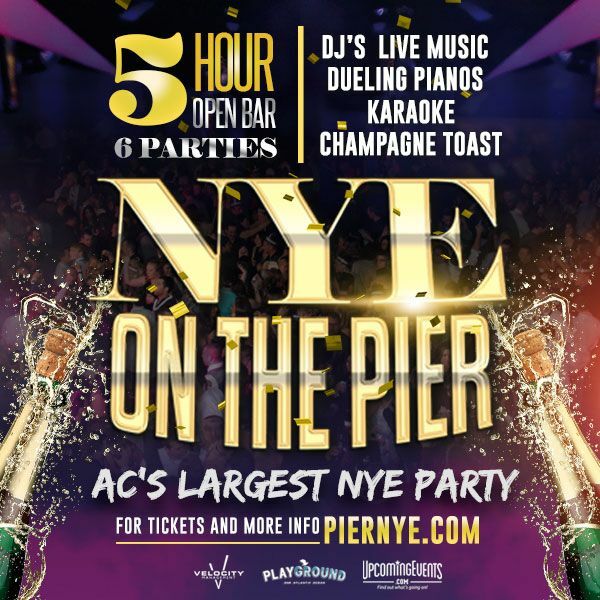 Join us at the Playground Pier at Caesars in Atlantic City and party until 4:00AM. The event sells out every year before New Year's Eve. So, don't wait - buy tickets now. This party will offer something for everyone! Don't believe us? Check out the video recap from last year below. Tickets start at a discount (from just $69.95!) and prices go up as we sell more tickets and get closer to the event date. It's best to buy early and save. Minimum of 4 guests required for purchase. Note this event is under new management and will be held in the entertainment section on the first floor at the rear of the Pier. Expect an incredible night like no other in AC ringing in 2019!!!! All sales are final. Please note that there will be a $20/ticket refund fee if you need a refund (must contact us prior to 12/28/18 at 11:59 PM), all other amounts paid will be refunded.